Here’s an interesting article that I found this morning. Mostly fascinating to me because I’m mentioned in it and I knew quite a few of the folks profiled. 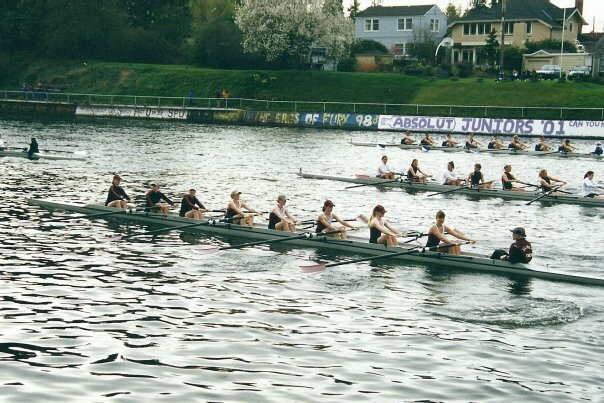 A girl I rowed with in college wrote an article detailing her struggles with an eating disorder during her fist few years of school, of finding god, and coming to terms with her body. 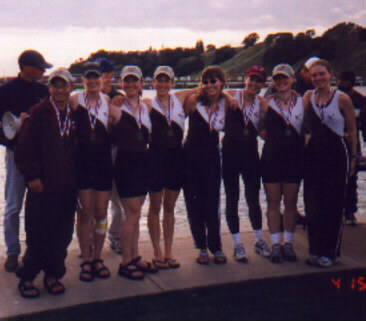 Both she and I made the lightweight team our first year - primarily because we’d rowed in high school. I remember the day she describes quite well, mostly because I lost most of my hair that afternoon and I was furious that my long, long hair contributed so very little to my overall body weight, come weigh-in time. And I was hungry. I’m never in a very good mood when I’m hungry. My closest friends were my competitors – my best friend Annie Chesnut who turned anorexic our last year of high school, all the girls skinnier than me who rowed on the lightweight team, the sorority sisters who hoarded bagels and granola bars and never came to house meals, my popular, manipulative boyfriend. What I didn’t know was that my strictest competitor (and my best teacher) would turn out to be the person I hated most – me and my body. Before every crew regatta, we’d all had to weigh in, each girl peeling her jersey over her head and stepping on the scale. Sonja, our team captain, weighed 132, two pounds over the lightweight cut-off. So she ate only rice cakes the day before each weigh-in, and then spent hours dressed in five layers of clothing, sweating off the pounds on a stationary bike in the boathouse. One time, she was just a sliver over – 130.4 pounds – so we’d all watched as another teammate took Sonja’s long cashew-colored hair in her left fist and a pair of scissors in her right, and sliced off the beautiful swishing bundle. It turned out her hair weighed a measly .1 pounds. She’d still not made weight, so she’d fasted all day in order to be allowed to row in the morning. That day is clearly etched in my brain, I was surprised that others remembered it as well. While I definitely struggled with keeping my weight low enough to compete at the lightweight level, I didn’t have the dangerous obsession with the scale that many women (and men), develop. Not surprising that they do, but I was fortunate enough to avoid that fate. Don’t get me wrong - that scale was a constant companion during the spring season and the fact that I ate exclusively lettuce and rice cakes, beginning on Wednesday night (for a Saturday race), didn’t make me particularly fond of the lightweight regimen. And, frankly, there were a few times when I dearly wished that I could just stick a few fingers down my throat and lose a few ounces of my stomach contents. It seemed like an easy solution, come time to step on that scale. But that never happened, thankfully. I actually did get to row in that race. Weigh-ins, for the big races in Sacramento, were held on Friday afternoons. We’d do our sweat-suit and bicycle routines on Friday, attend weigh-in, and then if you failed (and your hair failed you), you could do a last minute weigh-in with the officials on Saturday morning before the race. That’s what happened for that particular race although, having fasted for a few days at that point (and not having had Friday night to regain liquids), I was probably ineffective as a competitor. The lightweight crew team petered out after my sophomore year and I entered the ranks of the regular team as a rower of decent technique and middling ability. Not as gloriously fun as being on a stellar lightweight team but easier on the digestive tract. This has always come up at every coaching stop I've made. I know that a lot of people have been trying to come up with ways to fix the lightweight issue but it's a difficult and touchy subject. My current personal solution is 5 lbs for guys and 3 lbs for girls. If they are beyond that in the spring, I won't let them drop to lightweight. It's not a perfect solution by any means but it's evolving. I think that’s a pretty decent policy, Woody. Women seem to have a much harder time dropping the weight than men do so having lower limits for women seems appropriate. The most I ever had to drop was 13 pounds, beginning in January. That was not a fun spring season for me. Sonja, I never envied you lightweights! Rod once suggested I go lightweight and I just laughed. I was 3 inches shorter than you and 20lbs heavier (obviously he didn't have a good idea of what I weighed when he made the suggestion). I hope you're enjoying these last few weeks of pregnancy. I gained 55lbs with the boys, and a year later I'm only 10lbs over my pre-pregnancy weight. But I think that's just my body's buffer for nursing. Things are going well, pregnancy-wise! Thanks for asking. Still feeling pretty good although things are less fun now that we’re getting close. Whohoo on getting close to pre-pregnancy weight, I can only imagine the balancing act your body is performing right now; juggling the breastfeeding of twins while trying to return to a non-pregnancy stage.